TOMiGAi - WHEAT GERM 40 lbs. Pellet Size: "Medium-Large"
Best used for the growing season. Fortified with Probiotics presented to you in a Nitrogen sealed bag for Quality and Freshness. 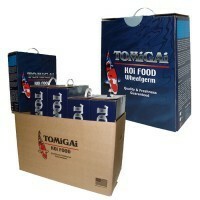 Taberu wheat germ Koi Food Best used for the growing season. which is mostly coming from white fish meal, it is fortified with Wheat Germ: another excellent source of protein.